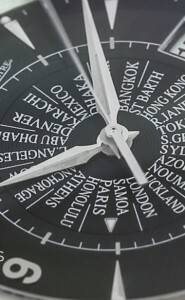 Tracing its history back to 1833, Jaeger-LeCoultre is known for innovation in watchmaking. With popular models including the Master, Master Extreme, Duometre, and the unmistakable Reverso, the name of Jaeger-LeCoultre is revered around the world. 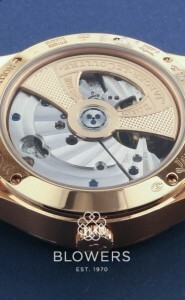 Specialities include complicated watches such as minute repeaters and tourbillons, together with ultra-thin watches. Another model which illustrates the brand’s innovation is the Memovox Deep Sea. Created in 1959, this was the first automatic diver’s watch equipped with a mechanical alarm. Whilst many diver’s watches rely solely on a unidirectional bezel to remind the wearer when to ascend to the surface, this model has an audible alarm as an additional aide mémoire. 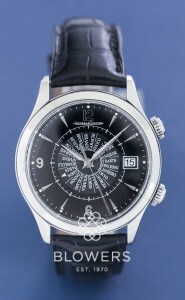 Jaeger-LeCoultre has a diverse array of models from simple to complicated, from sports to dress watches. The brand has delivered models to appeal to both male and female clientele. 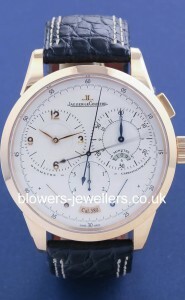 Jaeger-LeCoultre offers some superb choices for the discerning watch buyer. In some instances, pre-owned and used models provide tempting opportunities for the would-be collector to acquire a fine watch for significantly less than new, especially when housed in noble metals such as gold and platinum. Browse our selection below. All watches are available at our Kingston upon Hull boutique, and can also be viewed at our office in London Mayfair. 0% finance available.